Bowmar 901B, Commodore (cbm) C110, Craig 4501. 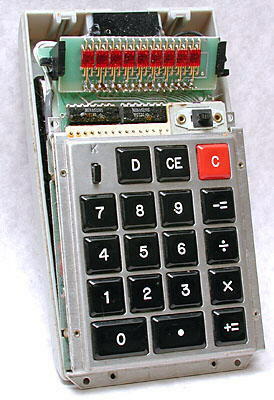 Distinctive features: One of the first pocket-sized calculators, and the first manufactured in the U.S.A.
4-function. The display extinguishes after the calculator is unused for some time and is redisplayed by pressing the "D" key. 77 mm x 131 mm x 37 mm. (3" x 5.2" x 1.5"). 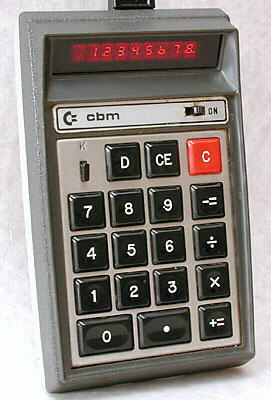 Has the distinctive Texas Instruments "Klixon" keyboard, common on calculators of this period. When first put on sale the Commodore C110 was the cheapest electronic calculator in Britain at £79 [approx. $190] - about 3 week's average wages at the time ! The Commodore C110 was very generously donated to the Vintage Calculators Museum by Richard Cosgrave, who says that his father bought it in 1972 for the princely sum of £72 from the jewellery department of a big department store! The inside of one of these calculators, actually the Commodore C110. Very prominent is the Texas Instruments "Klixon" keyboard, a high quality keyboard assembly widely used in early hand-held electronic calculators. Pressing the "D" key brings the display back on after it was automatically turned off after a period to conserve battery power. At the top are 9 separate LED modules (for 8 digits and 1 error indicator), with two display drivers integrated circuits below. The main integrated circuit is obscured by the keyboard. Bowmar was a manufacturer of LED (Light Emitting Diode) displays which moved into calculator production in the early 1970s. It was highly successful for a few years and was one of the biggest manufacturers of calculators, but closed down in about 1976 when it was hit hard by the huge drop in calculator prices. This model was re-badged and sold by other companies, as in the Commodore C110 (marked cbm, for Commodore Business Machines, for sale in Britain), and the Craig 4501. After a few years, and especially with prolonged trickle charging, the Nickel-Cadmium cells used in early calculators lose much of their charge holding capacity, and may start to leak chemicals. Here, Karl Schmitz has rejuvenated his Bowmar 901B by fitting a new set of six Ni-Cad cells, held neatly in pairs in plastic battery holders. He has since replaced the Ni-Cad cells with a set of more modern Nickel metal hydride (NiMH) cells. These give a similar voltage, but are much more tolerant of trickle charging, and so Karl should get years more enjoyment using this fine vintage calculator.